In the past year, I've covered two different proposals onusing space technology to create some sort of "shade" for the entireplanet that would save us from global warming. In covering those stories, wordslike "radical" and even "outlandish" seemed appropriate. Now, NASA has actually funded a more thorough study of athird "sunshade" proposal. Should I be worried that the government isactually thinking they need some sort of space-based fallback plan for theglobal warming problem? If you'd like to see the past proposals, take a look at the singlegiant concave fresnel lens at L1 solution and the spacering girdles the Earth solution. The new (third!) sunshade solution is proposed by University of Arizona Steward Observatory optics expert Roger Angel. He suggests that welaunch trillions of tiny (0.6 meters across) screens. 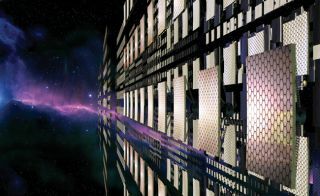 The screens would be thintransparent disks with little 0.1 meter protruding fins with solarenergy-gathering capabilities for position adjustment. The disks wouldessentially be lenses that would take a small amount of the sun's light(energy) and focus it away from Earth. They would be sent to the innerLagrange point L1, the point (or relatively small area) between the sun andthe Earth where the orbital period of any object becomes exactly equal to theEarth's orbital period. In other words, all of the trillions of tiny"lenses" could stay there forever without expending extra energy,shielding the Earth from about 1.8% of the sun's radiation, according to Dr.Angel. According to Dr. Angel's paper, just published in Proceedingsof the National Academy of Sciences, there would have to be a cloud oflenses about 100,000 kilometers long. To accomplish this, we would need tolaunch an 800,000 unit stack of these every five minutes for ten years.Angel suggests that this could be done with electromagneticrail launchers powered (preferably) by some sort of renewable power sourcelike hydroelectric or wind. As Dr. Angel puts it "...if there's nothing you can doexcept shade the planet, you may want to think about it." Now that we are getting more comfortable with large-scalespace construction projects, take a look at the giantfresnel lens and the spacering. Also, read more about Dr. Angel's solution in A Sunshade for Planet Earth and Space Sunshade Might Be Feasible in Global Warming Emergency.